Trinity College. Especially useful coverage on how to handle online sources. Includes citation guidelines & Biology statement on plagiarism. This is the official style of the American Anthropological Association (AAA). 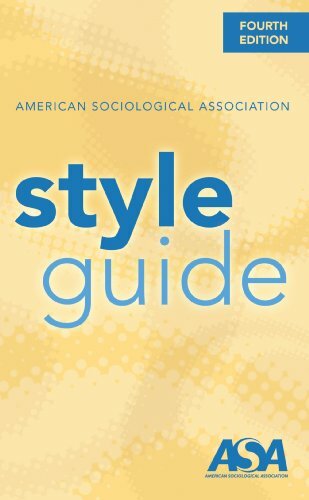 The style is based on the Chicago Manual of Style (16th edition), but it has a few unique features. The American Chemical Society (ACS) style is used by students and researchers in the field of chemistry. The American Medical Association (AMA) style is used for scholarly writing about medicine, health, and other subjects in the sciences. The American Psychological Association (APA) style is used by students and scholars in the social sciences, especially in the fields of psychology and sociology. The American Sociological Association (ASA) style is used for scholarly writing in sociology. The Bluebook is utilized by law students and law practitioners. The Chicago Notes & Bibliography style is used by students and scholars in the humanities; the Chicago Author-Date style is used by students and scholars in the physical and social sciences. The Council of Science Editors (CSE) style is used by students and researchers in the sciences. This citation style, was formerly put out by the Council of Biology Editors (CBE). The Modern Language Association (MLA) style is used by students and scholars in the humanities. Note: Log in with davidson\ and your username and password.